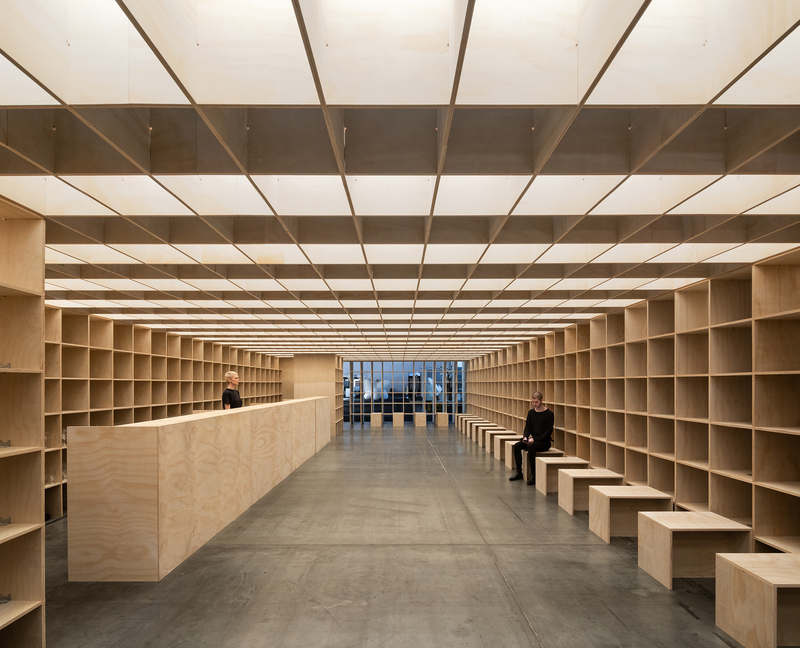 The Untitled (392 Sheets of Plywood) installation at IDS Vancouver represented the next instance of material exploration by Vancouver’s Leckie Studio. Known for creating material-driven and innovative architectural environments, Leckie Studio employ a design-build process to create an installation that will provide a space for vendors, media and visitors alike to connect and relax. Untitled (392 Sheets of Plywood) is part of an ongoing trajectory of material research that informs the work of the studio. Leckie Studio chose to work with a single generic material – plywood – with the aim to create a spatial experience that is formed with a singular tectonic and material language. The pavilion is intended as a place of refuge for visitors over-stimulated by the trade show floor – a place to relax and get away from the surrounding busy trade show, a place to enjoy and discover. The result is a semi-enclosed structure that provides a more intimate scale of space within the larger exhibition hall. The installation balances opposing forces of solid/void, open/closed, and vertical/horizontal. The space is loosely enclosed by three hundred and ninety-two sheets of pine plywood, assembled without the use of adhesives.The primary material connections are held in place with friction, utilizing an interlocking assembly system. The pavilion is visually permeable and can be accessed by either side. After the closure of IDS Vancouver, the structure will be dismantled and subsequently re-purposed. Untitled (392 Sheets of Plywood) is perceived as a sculptural mass, with a contradictory nature of appearing both solid and transparent, depending on the angle from which it is viewed. The intention is to create a voyeuristic relationship between the enclosed space of the bar and the surrounding circulation. Pulled deep into a visual haven, visitors are cocooned and buffered from the surrounded activity. Air, light, and sound penetrate intermittently through the thin planes of wood providing a real sense of intimacy. The minimal interior puts an emphasis on facilitating engagement between the guests so as to achieve a space for exploration and engagement. The surrounding space becomes a canvas for light and shadows where random silhouettes stream into the space through the surrounding voids.